The Spring ecology sampling season began at the beginning of March and our Sampling and Collection team are out and about, busy collecting invertebrate samples. 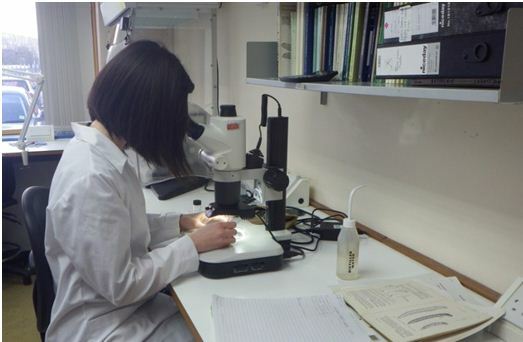 On 5th March a macro-invertebrate sample was collected by Laura (see previous blog post) on the Piddle Brook and brought back to the Analysis and Reporting Team’s laboratory in Tewkesbury to be preserved. The sample is now ready for me to begin the invertebrate analysis process. I begin the analysis by washing the sample through a very fine meshed sieve to remove all of the preservative. I have to be careful to make sure no tiny invertebrates are washed away down the sink! I then put a small amount of the sample into a white tray. The trays are divided into squares and I work through each square, pulling out all of the invertebrates present using small forceps. It can be difficult to spot them all in the trays, especially some of the very tiny ones! Can you spot the invertebrates in the picture of the tray below? 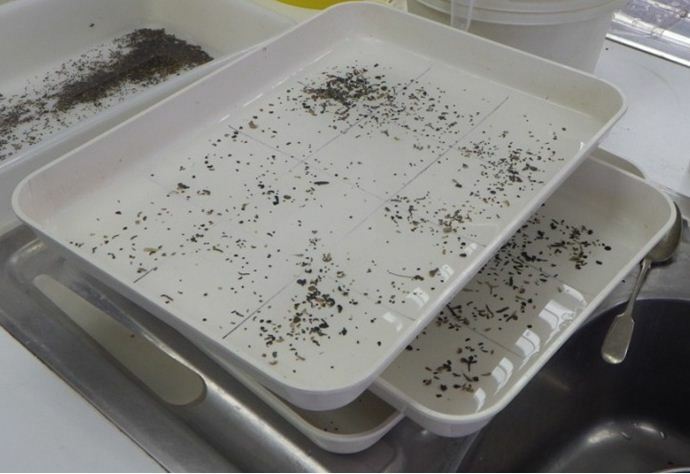 Once I am happy I have removed all the invertebrates from the tray I will wash the sorted section into a sieve. I then continue to take out all the invertebrates from the rest of the sample. This process usually takes me a whole day, a lot of patience is required for this job! After I have removed all the invertebrates from the entire sample I then move onto counting and identifying all the specimens. I have to identify them to species level, which I do using a high powered microscope, lots of identification keys and some very fine forceps! Species identification often involves looking at small features, such as tiny hairs, and dissection, such as mouthparts and gills. 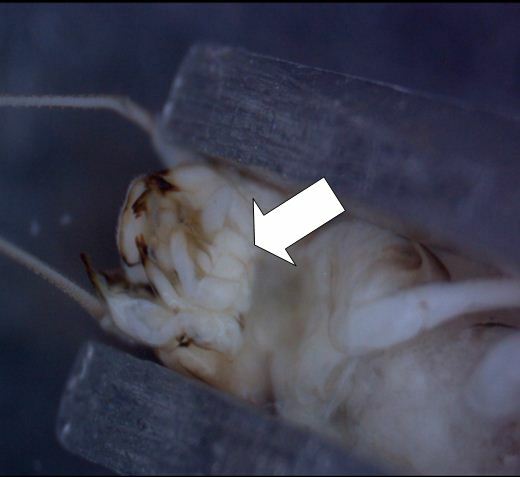 The picture below shows the mouthparts of a mayfly larva, Baetidae, which sometimes require dissection to identify to species level. To do this I need a very steady hand! After I have identified all the invertebrates I enter the list of species onto our ecology database, Biosys, and check to see whether the sample will be put through our Analytical Quality Control (AQC) system. To make sure my, identification and sorting remains at a consistently high standard, 1 in 10 samples are analysed again by AQC analysts. This can be a nerve wracking process but keeps us on our toes! Luckily my sample has not been selected for AQC, if it had been I wouldn’t have been allowed to exceed either 2 invertebrate family gains and/or misses in a sample. In order to keep my skills up to scratch, I also have to complete 4 species ring tests and at least 1 reverse ring test each year. The species ring test involves identifying a set of invertebrate samples to species level and successfully meeting the pass mark. If I’m selected for a reverse ring test I will put together a vial of all the species present in the sample which will be identified again by an experienced analyst. This may seem like a tough and thorough process but it is essential to ensure the data we collect is of the highest quality. 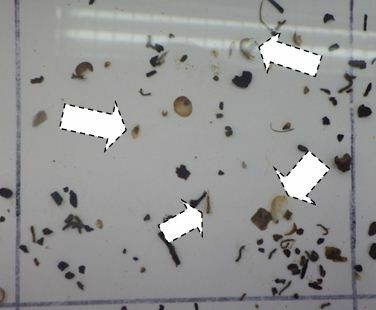 The invertebrate species present in the sample can give me a lot of information about the quality of the site because each invertebrate species has varying habitat preferences to different pressures. To help me do this there are a number of analysis tools and indices available. For example, the Proportion Sediment sensitive Invertebrates (PSI) index combines each species’ tolerance to sediment levels to create an overall score which indicates whether a site is impacted by sediment pressures. We use the Walley Hawkes Paisley Trigg (WHPT) index to analyse an invertebrate communities tolerance to organic pollution, which incorporates deteriorations associated with changes to taxa abundances. There are also tools available to analyse invertebrate community’s to see if they are impacted by flow, habitat and pesticides. As I’m analysing the Piddle Brook sample I notice it contains relatively high numbers of snails and small numbers of multi-gilled cased caddis and mayfly larvae. 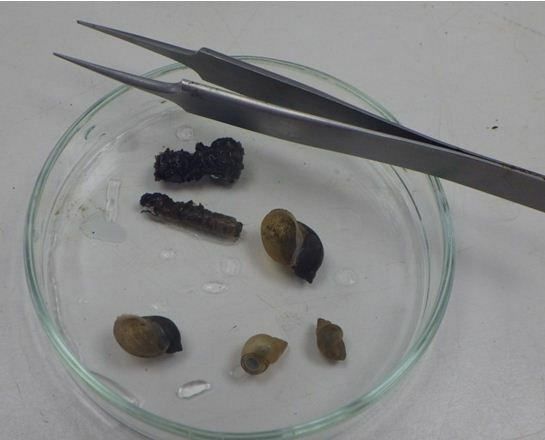 The picture below shows some of the snails and a cased caddis that I have found in the sample. These invertebrates favour habitats with sluggish flows and indicates to me that slower flows are experienced at the site. I haven’t found any highly sensitive taxa in the sample but there were a number of moderately sensitive taxa present, such as the caseless caddis Hydropsychidae and cased caddis Limnephilidae. The overall scores for the site are consistent with previous years’ data, indicating there has been no deterioration in quality at the site. The results from the sample will be used to classify the Piddle Brook for the Water Framework Directive (WFD) next year. The aim of the WFD is for all waterbodies to achieve Good status by 2027. To classify the invertebrates I identified for WFD the data will be combined with a sample collected in the autumn from the site and the results analysed using a tool called the River Invertebrate Classification Tool (RICT). The tool will compare the results from the site (the observed scores) to an un-impacted reference condition site (the expected scores for a site of this type) to create an Environmental Quality Ratio (EQR). The EQR will fall between 0 and 1, a score closer to 1 indicates a site which is less impacted. The EQR determines which of the 5 WFD classification groups (Bad through to High) the invertebrate site will be classified as. At the end of the day I thoroughly wash the sieves and trays that I used so they are ready for me to use tomorrow to sort the next sample. This entry was posted in Uncategorized by Dave Throup. Bookmark the permalink.